Parents and children had the opportunity to learn how to fit a bicycle helmet directly from police officers. Bicycle safety inspections were also offered for all ages. 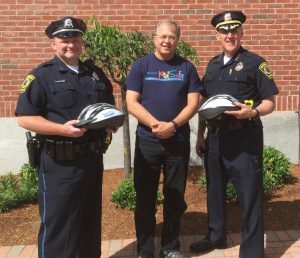 Breakstone, White & Gluck donated the bicycle helmets as part of our Project KidSafe campaign, which has donated over 10,000 bicycle helmets in eastern Massachusetts. We launched our campaign in 2013, with a simple goal: to help children ride their bicycles safely and to prevent head injuries. In Massachusetts, cyclists 16 years old and younger are required to wear a bicycle helmet. By wearing a helmet, cyclists can reduce their chance for head injury by 50 percent, according to the Insurance Institute for Highway Safety. Yet many cyclists still do not wear helmets. Breakstone, White & Gluck will make several bicycle helmet donations to local police departments this year. In recent weeks, we have made donations to the Cambridge Police Department as well as the Boston Police Department and others. These are important partnerships because local police departments regularly encounter children who are riding without helmets. By donating a bicycle helmet, we hope to encourage safe riding and create an opportunity for a positive interaction between police and youth. We invite you to visit our website and view our bike safety page. 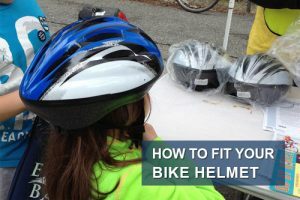 There is a video on how to properly fit a bicycle helmet as well as articles on cyclists’ rights in Massachusetts and understanding how car insurance impacts cyclists.